Pediped's fun new Online Easter Egg Hunt - How to get shoes for 1 cent! Pediped’s Online Easter Egg Hunt! 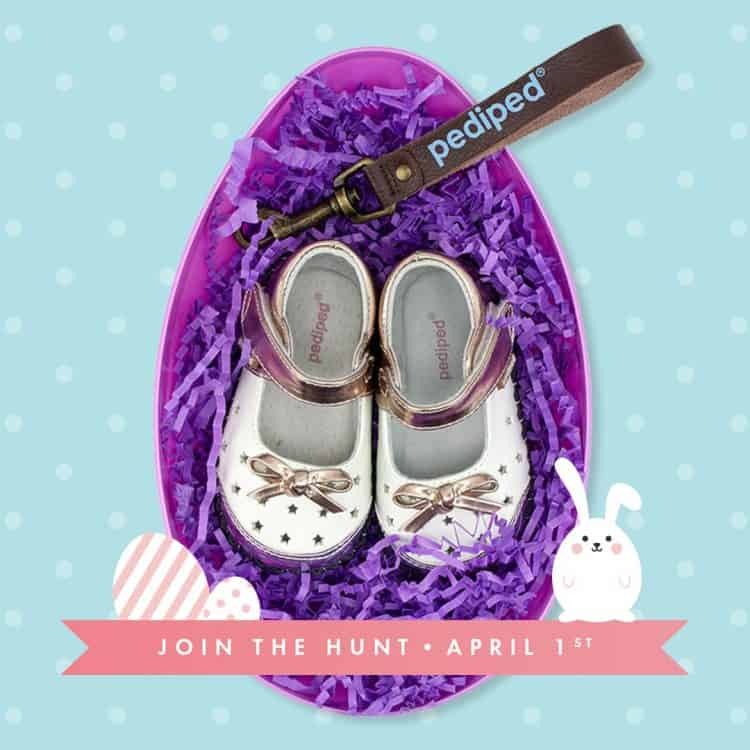 Find out about Pediped’s fun new Online Easter Egg Hunt and how finding the daily eggs will get you a pair of 1 cent shoes! We love pediped in our home. With 6 kids, it’s been a go to for our family since my oldest was a baby. Exceptional quality, unsurpassed comfort, and distinctive styling have made the award-winning company the fastest growing children’s footwear brand in the United States. pediped® footwear has been awarded the American Podiatric Medical Association Seal of Acceptance for the promotion of healthy foot development, and preeminent orthopedic medical professionals, Dr. Mininder S. Kocher and Dr. Thomas W. Vorderer, deem pediped® shoes an excellent choice for parents/caregivers who want their children’s feet to develop naturally and healthily. pediped® has received numerous industry awards and accolades including recognition from Earnshaw’s, the premier media resource serving the children’s market. Pediped has a fun online egg hunt planned they will do on pediped.com from 4/1 – 4/5 & 4/8 – 4/12. They will be running a website “egg hunt” where they hide an Easter egg somewhere on the site and the first person to find the egg gets a penny pair of shoes in their choice of size and gender. 1: Search pediped.com for a colorful “Egg Hunt” egg. 2: Select your size/gender, add to cart. 3: Place your order FAST! pediped® is sold in over 750 stores in the United States and 40 countries worldwide with an offering of more than 120 designs for boys and girls between its three lines, Originals®, Grip ‘n’ Go™ and Flex®. The award-winning footwear is available in EU sizes 17 to 38 (US newborn to 6 Youth). For more information, visit www.pediped.com. LIKE on Facebook at /pedipedfootwear and follow on Twitter and Instagram @pedipedfootwear.